Stuart Applebaum, our Emeritus Executive Vice President, Corporate Communications, was honored by UJA-Federation of the New York Publishing Division with its esteemed Harry Scherman Service Award for his nearly four-and-a-half-decade-long career and commitment to philanthropy. 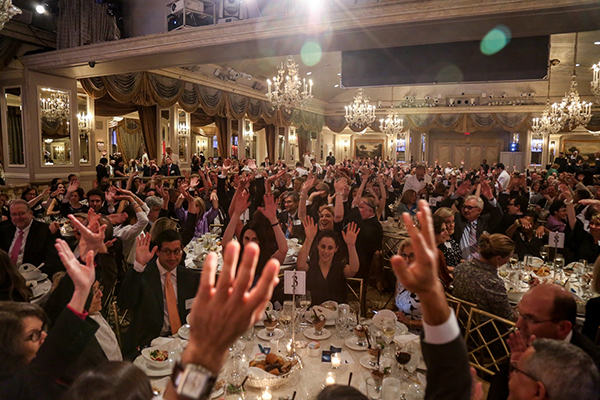 More than 500 book people from across the industry turned out for this annual dinner event Tuesday night at the Pierre Hotel in New York, which raised more than $670,000 for the philanthropy’s many endeavors to support its network of non-profit service organizations. Pictured: The Brothers Applebaum: Stuart (l) and Irwyn with the Harry Scherman Service Award. Stuart’s brother Irwyn, former President & Publisher of Bantam Doubleday Dell, delivered heartfelt and amusing remarks in tribute to his brother, “Applebaum the Elder,” noting Stuart’s sagacity, creative prowess, and work ethic. Irwyn also related that his brother was the embodiment of “Stu-dakah,” a variation on the traditional Jewish word,tzedakah, for generous acts of charity. Greeted by a warm and enthusiastic standing ovation as he took the stage, Stuart accepted his award with characteristic other-directedness and signature eloquence, noting that working at Penguin Random House is still his dream career: “For me, it’s all very simple: I love to work. And I love to work—full tilt, full time—at Penguin Random House. And I REALLY love to work with my Penguin Random House dear colleagues, who have turned out tonight in alarmingly large numbers. 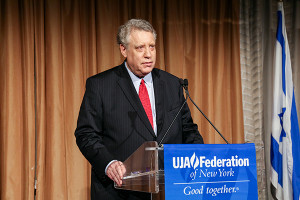 The stimulation, encouragement, and inspiration I receive every day from their publishing smarts—and their heart—galvanizes me nonstop.” Stuart dedicated the award to his father, an executive with UJA-FNY’s predecessor organization, Federation of Jewish Philanthropies, who inspired his belief in UJA-FNY’s mission and his dedication to giving back philanthropically through his Stuart S. Applebaum Giving Foundation. A tribute video starring his Penguin Random House colleagues offers further testimony to Stuart’s service, and his 52/24/7 commitment to being a great communicator about our company and champion of our publishers and our authors, helping them to reach the widest possible readership for their books. Scroll over the screen and click the start button to begin the video. 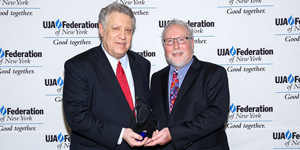 UJA-Federation has presented its publishing division dinner for nearly 50 years to recognize professionals in the industry who demonstrate the highest levels of leadership and philanthropy, both at work and in the community. This year’s evening was hosted by realtor Ryan Serhant, star of Bravo’s Million Dollar Listing, New York television series. Steve Potash, President and CEO of OverDrive, Inc., was also honored at the event. Our CEO Markus Dohle was honored at the dinner in 2014. Past recipients of the Harry Scherman Service Award include Random House Children’s Books’ Barbara Marcus.